Photograph of Ann's parents standing; seated her aunt, Ann, Mrs Willett, and Ann's sister Pamela. 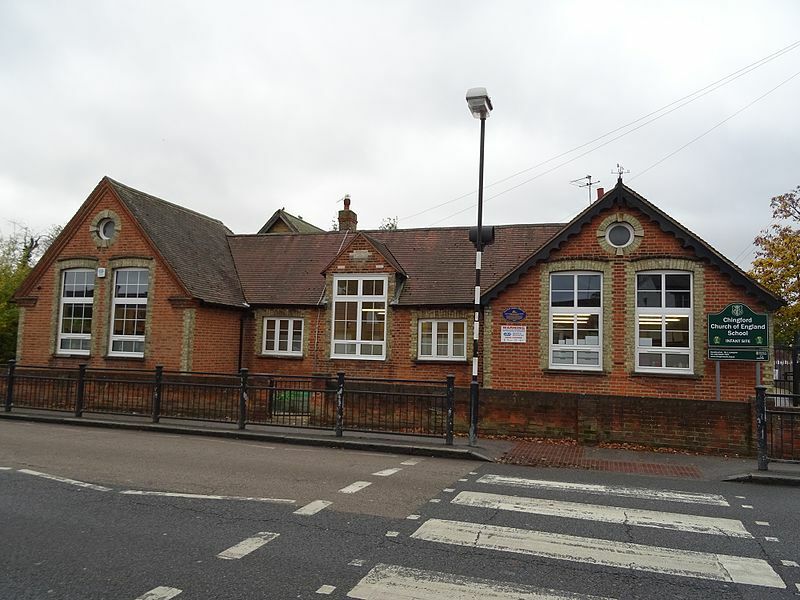 Having grown up in Chingford Essex and attended King's Road school from 1938 to 1944, I wondered if there were any plans to note the evacuation of the school, or at least the infants' section, to the village of Henham on September 1939. I found nothing on the school's website, so I then tried 'Henham' and found your request for memories of that period. Although I was only six years old at the time, and that first evacuation was only to last a few months, I have never forgotten the experience of leaving my family to stay with complete strangers. The morning of our departure we gathered outside our school with no word to our parents of where we were going or for how long. The Infants' school was to travel with their teachers on one bus and the Juniors on another, but brothers and sisters were allowed to stay together, hence my nine year old sister boarded the bus with me. My sister Pamela and I had small suitcases packed with underwear, nightclothes and woollen 'pixie hats' which our mother had knitted for us to wear with our navy raincoats. We must have had some food with us too. I now know that that we were not that far from home but we seemed to wander for hours through the hot September countryside until we finally arrived, in the late afternoon, at the village hall in Henham. All our parents were, apparently, frantic with worry thinking that our red double-decker bus might have been attacked on the way. The village hall was crowded with ladies who handed each child a carrier bag containing, among other things, a tin of condensed milk, a large bar of chocolate and some biscuits. We were looked over rather like goods in a store, which I found very embarrassing, but a voice soon said "Well here are two little girls for you Mrs. Willett" and we found ourselves being led out into the street by a kindly looking lady with beautiful silver hair. A memory written earlier on this site mentioned the village sweet shop, and that was to be our home for the next few months. The shop run by Mr. Willett, was an addition to the lovely thatched house 'Rose Cottage" which faced the school. There was an orchard to the side and behind the house were some barns and an old pigsty. Mr. Willett did not seem at all pleased to see us and told us at once that there would be no free sweets, but he did make the pigsty into a clean, dry playhouse for us. It cannot have been easy having two small girls introduced into his peaceful life. Mrs. Willett was a delightful lady who did her best to keep us, if not happy, content. Most of our friends ended up with equally kind people though one family was not so lucky and tried to run away. Having had pre-war holidays in the country, my sister and I were less shocked than other children by outhouses, oil lamps, tin baths and candlesticks to light our way to bed. Most of the time we lived in the kitchen but when our parents finally found where we were and were brought to see us by an uncle with a car, Mrs. Willett fed us all in her gleaming dining room that was kept for special occasions. I have no idea where our the teachers Miss Reader - headmistress - Mrs. Clark, Miss Franklin and Mrs. Clayton (?). were billeted but they soon organized themselves and their pupils, telling us that we would share the school with the local children and that we would use the classrooms in the morning one week and the afternoons the following week. They decided that during our free time we should go for long walks, but as there seemed to be only three ways out of the village, we soon became bored. It seems crazy now, but one walk was along the railroad track starting at the station halt, a converted railroad carriage, and passing a deserted gypsy caravan. We found that if we hid before the start of these walks, we could then retire to the station carriage and play our own version of school. Pam made friends with a girl of her own age who lived in a moated farmhouse some way past the church. I was fascinated by the bantam hens in the farmyard and we were sometimes given eggs to take home. My new friend lived next door but one to Rose Cottage; her family were the Whites. We were also invited to play with another girl who lived in a somewhat larger house to the right of the school..
Once a week, we went to the vicarage, where my sister and other girls had to knit garments for African babies. I could knit, but was only allowed to make vests for these poor infants using old stocking tops. Mrs. Willett was a regular churchgoer and when it was her turn to arrange the flowers we went along to help. For some weeks we also went to the service, but having been brought up as a Congregationalist I decided that I would go to the church just past our house. I now see on the Henham site that this was an Independent church which I assume suited all nonconformist villagers. Mrs. Willett would also go off to auctions and she always brought something for us, once an orange chiffon evening gown for dressing up. Now and then she would also 'dress up' too in an ankle length, burgundy lace dress, and go off to the village hall. I doubt that she was dancing so maybe these evenings were whist drives. Visits to Bishop Stortford on a local bus must have been for extra food and we were taken on these trips too. The Independent church hall was the meeting place for the Brownie pack and when Pam joined the group I went with her. There was a war on, so we had to practice First Aid and bandaging. I thought that using beetroot juice for bloody wounds was such a good idea I smeared my doll and teddy bears too. Alas, one of these Brownie meetings meant the end of this period in our lives. My sister was asked to take another girl, Patricia James, home, as she was not feeling well. Soon after neither was Pam and she and other children in the village were taken of to the isolation hospital in Saffron Walden, all had scarlet fever. Rose Cottage was fumigated, with large sheets hung everywhere and small explosions of some substance. Evidently this operation did not convince villagers that I was not infectious too and finding that the shop was being boycotted, Mrs. Willett had to send a telegram to my parents and ask that I be taken home. We did visit my sister in the hospital but had to stand outside and look through the window in to the ward. I never did have scarlet fever! I went home to a house banked with sand bags, had a little schooling in nearby homes, lived through the blitz in our air raid shelter, and eventually went to live with an aunt in Gloucestershire for two years. Pam started high school in 1941 and was evacuated for a second time too. 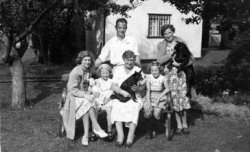 Our home survived a hundred-pound bomb that landed at the end of our garden and when we were both home again in 1945, we narrowly missed being killed when a V2 rocket landed outside our house, injuring our mother, and severely damaging our home. In 1974 when we had lived abroad for seventeen years, I took my mother, sister, and our children back to Henham for a brief visit. We tried to reconstruct those months spent in the village and found few changes - the sweet shop annex had gone, the farm moat filled in . We visited the church and churchyard under the suspicious eye of a local lady. Another lady in the village shop had vague memories of evacuees in the village but even in 1974 we were past history, and only the enclosed photo of my parents, aunt, uncle, Mrs. Willett, my sister Pam and I, is left to show that two little girls, for a brief moment in time, shared the life of the village of Henham..
We left before the photo of the evacuees shown on the Henham website was taken, but I do recognize my friend Audrey Cornish and another classmate Muriel. There cannot be too many people left who lived through this part of village history so I hope that my story and photo will add an interesting note to your archives. There is a British Evacuees Association which has more information about life as an evacuee.